OTTAWA, Ontario, Canada, December 17, 2012 (ENS) – Canada’s withdrawal from the Kyoto Protocol took legal effect on Saturday, December 15. Canada is the only nation out of more than 180 to legally exit the treaty that governs greenhouse gas emissions. “Harper’s Conservatives present us with a fake contradiction between environmental protection and a healthy economy. They want to fool Canadians by using per capita instead of overall greenhouse gas emission numbers. It’s high time honesty and integrity are reintroduced in our country’s debate on climate change,” said May. 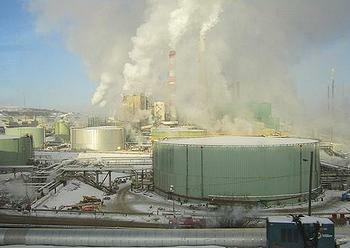 In 1990, Canada emitted 589 million tons of greenhouse gases. In 2010, that number rose to 692 million tons, a 17 percent increase. Under the Kyoto Protocol, which Canada ratified under a Liberal government, the country had pledged to reduce its total emissions by six percent between 1990 and 2012. In another move that critics warn will destroy Canadian environmental protections for future generations, the Harper Government has approved the C$15.1-billion sale of Nexen, an oil and gas company based in Alberta, to the state-owned China National Offshore Oil Corporation, CNOOC, the third-largest national oil company in China. Nexen has an interest in more than 300,000 acres in the Athabasca region of Alberta, with an estimated three to six billion barrels of recoverable oil sands resource. Ottawa also approved a C$6-billion takeover bid by Malaysian national energy company Petronas for Calgary-based natural gas producer Progress Energy Resources. In the last few weeks, more than 80,000 Canadians sent letters and emails to Parliament to protest the CNOOC takeover. New Democrats, the Official Opposition Party, said after consulting widely in Calgary and across the country, they do not believe these takeovers are in Canada’s best interest. The majority of Canadians indicated that they were opposed to the deal due to CNOOC’s poor human and environmental rights record, as well as the fact that CNOOC sees itself as the foreign policy arm of the Chinese government, said NDP Natural Resources Critic MP Peter Julian. “Canadians should be very apprehensive about the long-term economic and environmental consequences,” said Julian. The Harper Government has introduced a series of new rules for acquisitions of Canadian companies by state-owned enterprises from other countries, including the degree of control or influence a state-owned enterprise would likely exert on the Canadian business being acquired. From now on, foreign takeovers of a Canadian oil sands business by a state-owned firm will be found to be of net benefit “on an exceptional basis only,” the government announced December 7. By mutual agreement with the Committee on Foreign Investment in the United States (CFIUS), on November 27 CNOOC and Nexen Inc. withdrew and resubmitted a Joint Voluntary Notice with respect to the proposed acquisition of Nexen by CNOOC Limited. Discussions with CFIUS continue. The closing of the CNOOC-Nexen deal remains subject to the receipt of applicable government and regulatory approvals, by the relevant authorities in the U.S., the EU and China. Nevertheless, China is already forging another takeover deal in Canada. PetroChina Co. said December 13 that it would pay C$2.18 billion to purchase just under 50 percent of a natural gas project with Calgary-based Encana Corp. Under the joint venture arrangement between Encana and Phoenix Duvernay Gas, a wholly owned subsidiary of PetroChina, the two companies will explore and develop Encana’s Duvernay land holdings in west-central Alberta.